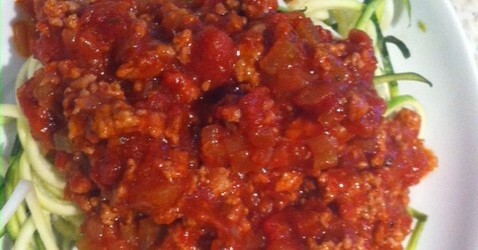 This is a lighter, lower fat version of regular bolognese. Turkey is a good source of tryptophan which can help to boost our mood. Courgetti is a great way of getting extra vegetables into your diet and cutting down on starchy carbs. 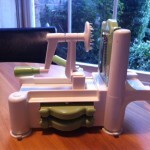 I use a handheld spiraliser to make my courgetti. Generally I just add the sauce to the raw courgette and this warms it through. If you prefer you can steam it slightly but make sure it doesn’t get too soft. In a large heavy based pan, gently sweat the onion and garlic in the olive oil over a moderate heat for around 10 mins until soft. Stir all the time so it doesn’t burn. Stir in the vegetable bouillon. Put the lid on the pan and simmer gently for about at 15 mins or longer.